Directions to Stop #2: Tour Stop 2 is located at the US Highway 69 exit for State Highway 52 East (Butler). Get heading west on Santa Fe Trail. 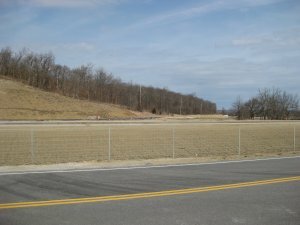 Turn right (north) onto State Line Road and travel for about one half mile to 119th Street. Turn left (west) onto 119th and travel for about 3.3 miles until you get to Blue Valley Parkway. Turn left (south) onto Blue Valley Parkway. After about 1.3 miles the road merges onto US Highway 69. 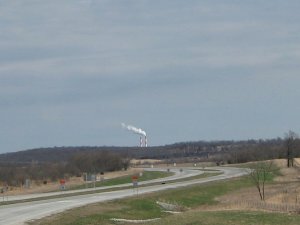 It is about a 45 mile drive to the State Highway 52 (East) exit. There is a new rest area being built in the southeast corner of this intersection. If it is open, you will find it convenient to park there. This tour stop is located near Pleasanton, Kansas 66075. Description: Price's retreat south was hindered by his massive wagon train having almost 500 wagons and herd of 3,000 cattle. Price had failed to plan ahead and bring a sufficient number of wagon masters on the expedition. A number of his commanders had argued with Price to get him to abandon the wagon train. Abandoning the wagon train would them to make a rapid retreat to safety. Price was extremely reluctant to abandon the only tangible success he had to show for the Missouri Expedition. Also slowing his progress were large numbers of refugees accompanying his army in retreat. The army was on the Military road heading for Trading Post, Kansas on the Marais des Cygnes River about 55 miles south of New Santa Fe. Once they crossed into Kansas there was food and forage aplenty. The army looted what they needed and destroyed what they couldn't take. Shelby encouraged this looting to exact revenge for Lane's and Jennison's raids into Missouri. Price's army camped at Trading Post for the night of October 24. Trading Post is located less than a mile south of where you are standing. At this point the Military Road was located in the same place as US Highway 69. Look north towards the two cooling towers in the distance. This was the path of the Military Road from the north - it to the east of US Highway 69 from here to the north. The Federal pursuit column left New Santa Fe between 8:00 and 10:00 A.M. on the morning of October 24th. Following the Confederates was easy because of all the stragglers and abandoned equipment left in their wake. The Federals camped at West Point, an abandoned village about 47 miles south of Little Santa Fe and about 9 miles north of Trading Post. The Union commanders (Curtis, Blunt, Pleasonton, Senator Lane, Sanborn) met to discuss what to do next. Blunt wanted to get across the Marais des Cygnes River, flank the Confederates and attack at dawn. Curtis was cautious and did not agree. Curtis decided to continue, but with Pleasonton's Division in the lead. This made Blunt angry. Many of the men in Blunt's division were from the area, but they were not consulted about the lay of the land. Curtis and Blunt wanted to attack immediately. Pleasonton agreed but said he was too sick and designated Sanborn to direct the advance. Sanborn advanced to the mound and deployed his forces on both sides of the military road. It was raining heavily with thunder and lightning. It was getting dark and Sanborn called off the attack at 10:00 P.M. He withdrew to one half mile north of the mounds. The Confederate rear guard had occupied the mounds north of Trading Post. 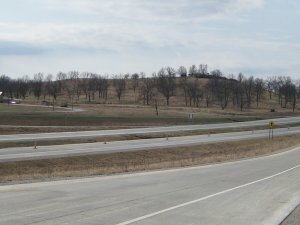 If you look to the north, you will see The Mounds, one on either side of US Highway 69. 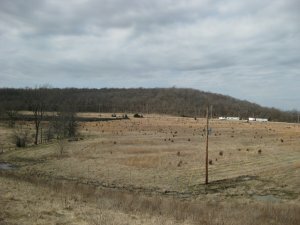 Cabell's Brigade (about 2,000 men) was on the east mound north of Trading Post. 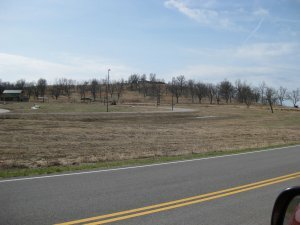 A smaller force of about 300 men from Colonel W F Slemmons' Brigade occupied the west mound. Two small two-pounder skirmish guns were placed on the Military Road between the two mounds. Cabell notified Price of the Union advance and Price's army and wagon train crossed the Marais des Cygnes River before daylight. Sanborn moved his two batteries (six rifled guns) into position about a half mile north of the mounds. These opened fire around dawn on October 25th. His attacking force of 900 union cavalrymen were going up against 2,300 Confederates. The west mound had a considerable cover of trees an rocks. The attack on the west mound succeeded in pushing the confederates back and some of the attackers reached the Marais des Cygnes river before having to fall back. The attack on the east mound was less successful. The Federals attacked the east mound after the federal artillery fire stopped. The Confederate defenders had troubling seeing the advancing Federals who had gotten to the base of the mound before daylight. When they reached the summit they found that the Confederates had already left. The Confederate rear guard quickly crossed the river to join the main army. There was a mounted pursuit by regiments from Sanborn's Brigade and Benteen's Brigade and they arrived at the river ford in a short time. About 100 prisoners were captured in Trading Post along with a number of Price's wagons and cattle. The heavy rain and all the wagons and cattle had turned the roads into quagmires. It took the Federals most of the day to get their artillery and units across the river. Sanborn did get a couple of Federal regiments across the river to pursue the retreating Confederates. They were confronted by a new rear guard formed by forces from Marmaduke's Division and Hynson's Texas Battery. Sanborn soon got three brigades (3,500 men) across the river along with two pieces of artillery and commenced to attack. About 10:00 A.M. the Confederate rear guard withdrew. Price was now using elements from Marmaduke's Division and Fagan's Division to serve a a rear guard. Price had gone with Shelby's Division ahead to attack Fort Scott and capture what government stores were there. Price's Army was now strung out over a distance of 8 miles. They reached the Little Osage River and made camp to eat and rest about 15 miles south of the Marais des Cygnes River. Philips' and Benteen's Brigades continued the pursuit with Philips in the lead. They followed the Fort Scott Road which crossed Mine Creek at Potosi, Kansas. They came into view of the Confederates about 11:00 A.M. The Confederate rear guard was formed north of Mine Creek with its artillery ready. Philips formed on the right and waited for Benteen to arrive. Now it's time to move to the next tour stop.